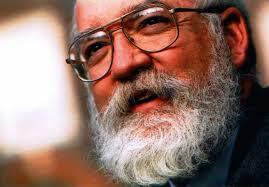 Daniel Dennett is a philosopher with a mission to infuse some empirical sense to the problem of consciousness. I met him personally in Tucson Arizona in April 2006, when I interviewed him for the popular science magazine Focus, that I used to edit then. A burly and affable man who enjoys speaking to non-experts, with a distinctive white beard, radiant blue eyes and a keen sense for sarcasm, he is perhaps the closest to a modern version of an ancient Greek philosopher. As one may imagine, he thinks very low of Plato and very high of the pre-Socratic materialists and of Aristotle. His views on the mind problem have upset many of his colleagues in the dualist camp – particularly his dismissive take on qualia, on which he expanded in his 1991 landmark book “Consciousness Explained“. Dennett refuses to accept that the mind is mysterious and somehow beyond the scope of science. He often uses the analogue of magicians who trick our minds into believing impossible things. The lady on stage is never sawn in half – and yet it always seems that way. Likewise, he claims, our brain convinces us that we have “consciousness”. Qualia – or subjective experiences – are therefore magical illusions created by material processes in the brain. There is no “hard problem”: it is only a matter of time for empirical science to explain subjective experiences, as it has done so with many other previously-considered as “mysterious” phenomena. At the core of Dennett’s empiricism lies the notion that mental phenomena are identical to neural processes taking place in the brain – an idea often termed “identity theory”. This notion is similar to saying that lightening is identical to electrical discharge, or water is identical to two molecules of hydrogen bound with one molecule of oxygen. The language we use to describe a certain phenomenon should not confuse us. We talk about “consciousness” as if it is something unitary, when in fact it is the result of multiple interactions taking place at the level of “unconscious” molecules. Identity theory is thus an idea driven by scientific development and the reductionist credo that, ultimately, all natural phenomena can be reduced to interacting elementary parts. In the case of consciousness these elementary parts would be neurons. Although Dennett is not a neuroscientist he has attempted to put together a comprehensive, philosophical theory for consciousness, which could provide a model, or an interpretation, for scientific findings. In his public lectures he often uses setups from cognitive psychology experiments. These experiments aim to identify and meaningfully understand discrete mental states in the brain. One of these mental states is “awareness”, the moment we actually become aware of something. For instance, there is an experiment when one is shown two slightly different photographs in quick and repetitive succession, and is asked to spot the differences. Dennett uses such experiments in order to demonstrate that it takes us several seconds to become aware of the differences between the two similar photographs. And yet the information from the photographs has arrived at our brain almost instantaneously. What happened between the time of information arriving and us becoming aware – or conscious – of the difference between the two photographs? Dennett, as well as the cognitive psychologists, argue that our brain processes information without us being conscious of that. For Dennett, the brain creates several versions of what is going on out there, like an author who writes several drafts of the same story. Consciousness is when one of those drafts becomes the dominant one. In other words, the mental state we call “awareness” is identical to the end of a process during which our brain has edited out all other drafts of what is happening out there leaving but one. What drives the editing process in our brain are intentions. And intentions are fundamentally linked to our survival. To understand this, let’s think of the experiment in different terms. Instead of two slightly different photographs flipping in the safety of a psychologist’s lab, let us imagine ourselves a million years ago in the African savannah watching out for lions in the bush. The wind sways the grass and our vision constantly processes the visual information our eyes receive. Evolution has made humans and other animals not to look at a scene in fixed steadiness (as most birds do); our eyes move around locating interesting parts and building up a mental, three-dimensional map corresponding to the scene. This saccadic, as it is called, movement of the eyes is unconscious and it happens because the central part of our retina that provides the high-resolution portion of our vision is very small. If you put your arm out in front of you and focus on the nail of your thumb, this is how small your eyes’ resolution is at any time. Saccades are the fastest movements produced by the human body, the peak angular during a saccade reaching 9000 per second. Back to the savannah, our primate eyes would transmit visual information to our brain in a constant “spot the difference” game, in case a lion emerges from the grass. If a lion does appear, then those multiple drafts of what is going on would have to quickly reduce to a single moment of awareness (“gosh, a lion!”) that would prompt an urgent flight-or-fight decision (“let’s climb up that tree!”). Thus Dennett recognizes a de facto evolutionary aspect to consciousness. If one accepts an empiricist approach to the mind problem it could not have been any other way. If consciousness is a biological phenomenon then it must have evolved over time. Creatures with simpler nervous systems should exhibit longer moments of awareness or, in the case of animals without a central nervous system, no awareness at all their flight or fight reactions being purely automatic. This is a testable hypothesis that adds additional intellectual weight to the empirical approach. It also argues that “meaning” is a value system that has evolved in a Darwinian manner. Our meaningful, subjective, experiences are therefore identical to the evolved self-organization of mental states in our brain. Dennett’s reductionist ideas fully support the computer metaphor of the brain. The grey matter in our skulls can be reduced to an information-processing machine. But what exactly is information? What is it made of? Eminent scientists, such as Stephen Hawking, believe in the downloading of consciousness and digital immortality. Could it be that the brain is a material machine processing immaterial bits? Could the Self be something different from the brain – a complex pattern of bits? Does materialistic empiricism lead us back to the arms, or fangs, of non-materialistic dualism? Dennett D. (1991), Consciousness Explained, Little Brown and Co.
 Chalmers D.J., (2002), Philosophy of Mind: classical and contemporary readings, Oxford University Press. Indeed, Dennett’s theory of consciousness is called “Multiple Drafts model”. Birds are different; the make a graphical map that relies in detection of angular movement by their retina. Thanks for your very valid comment. Indeed first person versus third person reporting in studying consciousness seems very problematic, till now. If one takes a dualist, or Platonic, view of consciousness then this problem is epistemologically fundamental and will never be surpassed, regardless of what technological advances may come in scanning the human brain. For an empiricist, however, it is only a matter of time before resolving this problem. Consider a medical parallel: there was a time – not too long ago – that most medical diagnoses were made on the basis of a physical examination and the patient reporting. Nowadays, biochemistry provides third person (“objective”, falsifiable) reports that are not only adequate, but often very much better at diagnosing a disease than first person (“subjective”) reporting. If consciousness is a biological phenomenon (I think it is) then ultimately we will be able to decode it on the basis of purely third person observations. Let’s wait and see..